Vice Chairman, PR Committee head, The Japan Woodworking Machinery AssociationCouncilor. 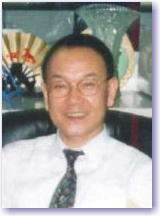 The Japan Wood Research Society Committee member. NPO Umi-no-Mori-Tsukuri (Ocean forest promotion) Association. The focal point of NISSHIN brand machines and equipments is not just in safety, efficiency and the automation quality, but to produce a product that meets the user's demand with accuracy and consistency. NISSHIN is a group of technicians with a cutting edge, an engineering firm of unprecedented unique being having advance technology as a manufacturer, and extensive knowledge, wide information network and flexibility of thinking as a trading company. "Creation and Servicing" is at the core of NISSHIN. First we think in the standpoint of users for streamlining of their existing machines and equipments. We, then, consistently make improvements by detailing the existing process. Because the delay will only cause the economic loss, NISSHIN promptly and swiftly provides to our users the software needed for improvement of the hardware. Users then will be allowed to make a choice and would get to the apposite result on time. At NISSHIN, we believe the essence of service is in the process of nonstop challenge everyday for greater technical innovation, and to continue to assemble the software to reflect it into strengthening the hardware. At NISSHIN, "Integrated Responsibility Achievement Program" is adopted. Layout → Design → Production → Delivery → Site Construction → Test Run → Technical Guidance → After Sales Service is realized in single flow of the operation. Upon constructing a new plant, we systematically participate as an engineering consultant from the initial stage. Special dedicated machines and equipments designed and built with market needs, customization of existing gears, its sales, optional transporter to fit the specification of the machine, central air supplier, dust collector and incinerator. In all these, engineers' competence is demonstrated. Stagnation is against our belief. NISSHIN KOOSAN is progressing. We persistently keep challenging to develop the best result possible. NISSHIN is proud of its "Spirit of Development". Work is made of people. There is trust where there is work. There is work where there is trust. Trust is gained from honest daily hard work. Designing and manufacturing of two-by-four lumber machine, two-by-four thurs pick-up software and hardware, house panel processing machine, metal fitting processing machine, transporter, dust collector, incinerator, synthetic resin processing machine, special automated machine. Designing, producing and sales of carbonization plant, environmental related products and plant layout.